The new Anne P. and Thomas A. Gray Library and MESDA Research Center at Old Salem Museums and Gardens in Winston-Salem, North Carolina, houses an impressive array of resources, including more than 20,000 catalogued volumes focused on southern history, material culture, and decorative arts; a craftsman database with more than 84,000 artisans; and an object database with more than 20,000 examples of southern decorative art. Captain John Smith (1580–1631), London, 1632. 10Y x 7½ inches. Promised gift of Thomas A. Gray in memory of Anne P. and Bahnson Gray. Fig. 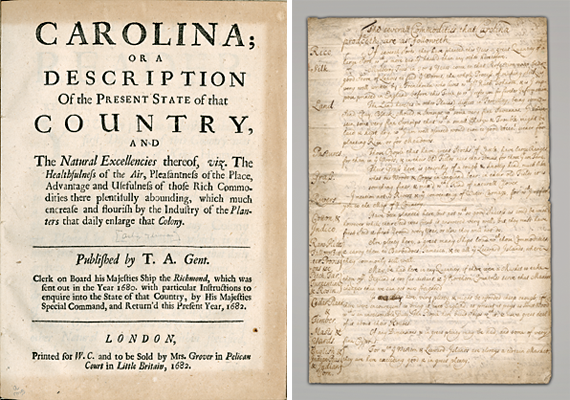 2: Carolina or a Description of the Present State of that Country, Thomas Ashe, London, 1682. 8C/af x 6V inches. Promised gift of Thomas A. Gray in honor of Ted Gossett. In 1680, Thomas Ashe was clerk on the Richmond that set sail for Carolina. He returned to England in 1682 and published an account of what he saw. Ashe described how “…at Carolina they have lately invented a way of making with (corn) good sound Beer…when duly fermented, a strong Spirit like Brandy may be drawn off from it, by the help of an Alembick.” In other words, the settlers had invented moonshine. Fig. 3: “The Several Commodities that Carolina Produceth are as Followeth…” Letter from Edward Hyrne (b. ca. 1660) to Burrell Massingberd (1682–1728), South Carolina, 1700. 13G/af x 8Y inches. Promised gift of Thomas A. Gray. In 1700, Edward Hyrne, then about forty years old, arrived in the Carolina colony. His wife joined him there the following year and they purchased Medway Plantation in Berkeley County, South Carolina. Letters from Elizabeth Hyrne to her brother Burrell Massingberd describe life on the frontier of English empire, including the loss of their house to fire in 1704.1 This previously unpublished letter from Edward to his brother-in-law describes the colony’s lack of tradesmen, the necessity of acquiring from England all household goods “except wood-work,” and the importation of logwood from the Bay of Campeche. Fig. 4: A New Voyage to Carolina, John Lawson (1674–1711), London, 1709. 8V x 6¾ inches. Promised gift of Thomas A. Gray in honor of Thomas Kenan III. 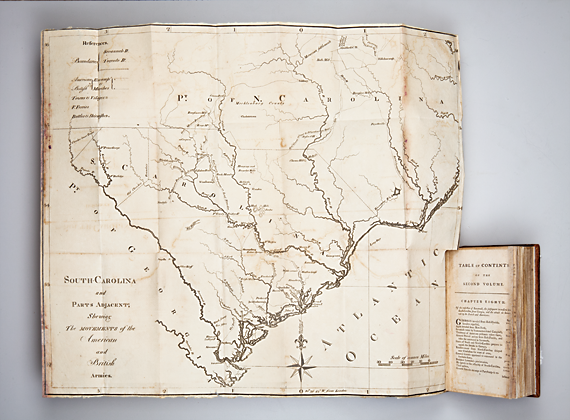 John Lawson’s account of his thousand-mile trek through the interior of North and South Carolina is one of the earliest and most important natural histories of the South. It also contains an account of native fauna, including the possum, which Lawson writes, “is the Wonder of all the Land-Animals…if a Cat has nine Lives, this Creature surely has nineteen.” Fig. 5: Reasons for Establishing the Colony of Georgia…, Benjamin Martyn (1698–1763), London, 1733. 9V x 7A/af inches. Promised gift of Thomas A. Gray in honor of Dale L. Couch. This early account of Georgia by Benjamin Martyn, secretary to the Georgia Trustees, lays out the social and economic goals for the new colony. 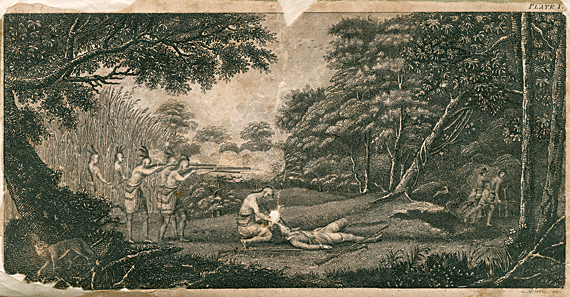 Included in Martyn’s tract is an engraving that depicts the laying out of Savannah. Georgia was intended to be a relatively egalitarian society. The engraving depicts English, African, and Native Americans laboring together in a harmonious manner to clear the forest and erect a substantial log structure; in the distance the familiar form of the Savannah town plan takes shape. Fig. 6: A Brief Account of the Rise, Progress, and Present Situation, of the Orphan House in Georgia…, George Whitefield (1714–1770), Edinburgh, Scotland, 1748. 6W x 4C/af inches. Promised gift of Thomas A. Gray in honor of Jackie and Tony Montag. This account of the Bethesda orphan house founded by the evangelical preacher George Whitfield in Savannah, Georgia, in 1740, presents one of the earliest engraved views of an American building. It also includes a second foldout plate with the names of the orphans who lived at the orphanage between 1739 and 1746 and the families to whom they were eventually placed out, to learn trades ranging from bricklaying to blacksmithing. Fig. 7: The Memoirs of Lieutenant Henry Timberlake…, Henry Timberlake (1730–1765), London, 1765. 8C/af x 5¼ inches. Promised Gift of Thomas A. Gray in honor of Mary Jo Case. Henry Timberlake’s journal presents one of the earliest accounts of life in present-day Tennessee. 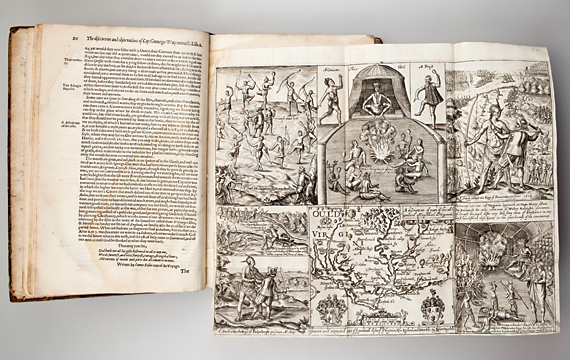 Its description of Cherokee culture and its map of Cherokee settlements is an important document of Native American life in the early South. Fig. 8: Two dollar bill, North Carolina currency, Hillsborough, N.C., 1775. 4X x 2AE/af inches. Promised gift of Thomas A. Gray in honor of Robert Leath. 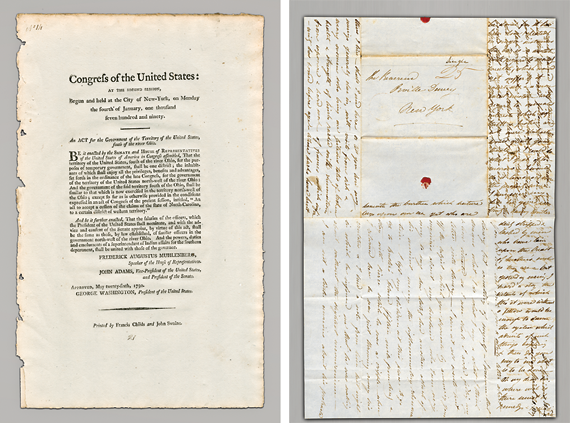 The Gray manuscript collection houses the finest collection of North Carolina colonial and obsolete currency, including this note authorized on August 21, 1775, by North Carolina’s Provincial Congress. Meeting in Hillsborough, they authorized £125,000 in bills of credit, payable in Spanish milled dollars. Issued in denominations ranging from $1/4 to $10, this is the only $2 note known to survive.2 Its vignette depicts a North Carolina soldier standing next to a trophy of arms. Fig. 9: The History of the Revolution of South Carolina…, David Ramsay (1749–1815), Trenton, N.J., 1785. Promised gift of Thomas A. Gray in honor of Mrs. Mary E. S. Hanahan. David Ramsay, a Pennsylvania-born, Princeton-educated, Charleston, South Carolina, physician, believed that “the revolution of the governments of American, from British provinces into independent states, exhibited many useful lessons, both to princes and people.” Ramsay’s two-volume account of the conflict is one of the earliest histories of the American Revolution and includes a number of maps and plans detailing the conflict in South Carolina, nicknamed the Palmetto State for its state tree. Fig. 10: “Broadside Announcing An Act for the Government of the Territory of the United States South of the River Ohio,” printed by Francis Childs (1763–1794) and John Swaine (1762–1794), New York, 1790. 13E/afx 8E/af inches. Promised gift of Thomas A. Gray in honor of Dr. Benjamin H. Caldwell Jr.
After North Carolina ceded its claims to the region west of the Smoky Mountains, Congress passed an act establishing a government for the future state of Tennessee, referred to in the broadside as “the Territory…South of the River Ohio.” This act provided for a government in Tennessee along the same lines as that established in the Northwest Territories in 1787, with one major exception. While slavery was prohibited in the Northwest Territories, an act passed by Congress on April 2, 1790, permitted it “South of the River Ohio.” Fig. 12: Letter from Frances Anne Kemble (1809–1893) to Reverend Orville Dewey (1794–1862), St. Simons Island, Georgia, 1839. 15AA/af x 9AC/af inches. Promised gift of Thomas A. Gray in honor of Elle Shushan. The British actress Frances Anne “Fanny” Kemble left the stage in 1834 to marry a wealthy American plantation owner, Pierce Butler. Uncomfortable with the slavery she saw on her husband’s plantations in Georgia, she spills out her thoughts on the subject to the Reverend Orville Dewey, a New York Unitarian minister. “Where evil is there must be remedy…I could literally & in fact free all these slaves…I could do what I speak of tomorrow—I would do it tomorrow were the property mine.” Kemble divorced her husband in 1849, but kept quiet about her abolitionist feelings until 1863. That year she published Journal of a Residence on a Georgian Plantation 1838–1839 in England and New York. Henry Gore, Frankfort, Ky., 1812. 8½ x 5¼ inches. Promised gift of Thomas A. Gray. The library is also home to the Thomas A. Gray Rare Book and Manuscript Collection. This collection of books and manuscripts spanning four centuries _ from 1590 to 1865 _ represents a lifetime of connoisseurship for Tom Gray, a former director of the Museum of Early Southern Decorative Arts and cousin of MESDA founder Frank L. Horton. 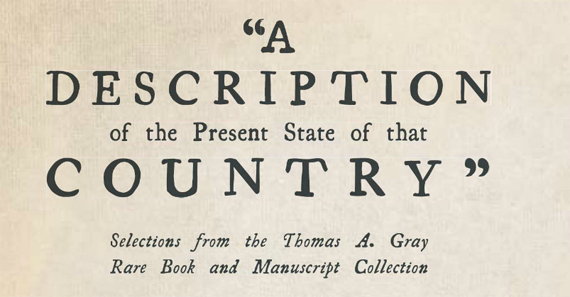 What began as an assemblage focused on Tom’s home state of North Carolina gradually expanded to include important texts from all seven southern states that formed the original Confederacy. Highlights from the collection will be on view in MESDA’s G. Wilson Douglas Jr. Gallery through September 1, 2013. For more information, call (336) 721-7360 or visit www.MESDA.org. Daniel Kurt Ackermann is associate curator of the Museum of Early Southern Decorative Arts (MESDA) at Old Salem in Winston-Salem, North Carolina. 1. Albert J. Schmidt, “Hyrne Family Letters.” The South Carolina Historical Magazine 63, no. 3 (July 1, 1962): 150–157; and Pauline M. Loven, “Hyrne Family Letters, 1699–1757.” The South Carolina Historical Magazine 102, no. 1 (January 1, 2001): 27–46. 2. Eric P. Newman and Stuart Levine, The Early Paper Money of America (Iola, WI: Krause Publications, 2008), 321.